WHAT DOES IT MEAN TO BUILD A HUMAN-CENTRIC INTERNET? Meet people who are doing it. Learn how to do it. Build it together. Internet of Humans is a track within our annual Edgeryders festival. It is dedicated to bringing together existing projects into a demo of a Next Generation Internet that supports values of openness, cooperation across borders, decentralisation, inclusiveness and protection of privacy. Edgeryders is a company living in symbiosis with an online community of thousands of hackers, activists, radical thinkers and doers, and others who want to make a difference. We believe that a smart community outperforms any of its members; this is the result of people working together, improving on each other’s work. We are on a journey to help one another navigate the changes that are happening in different parts of the world. How are we building good lives against a backdrop of massive social, economic, ecological and political challenges? How are we creating opportunities for ourselves and where can we support one another better? In work, health, family, community life? How are we building the evolution of the Internet and our digital technologies so that they support these efforts? We are interested in what participants already are doing in different parts of the world, and what we can do together. Are you our next Fellow? 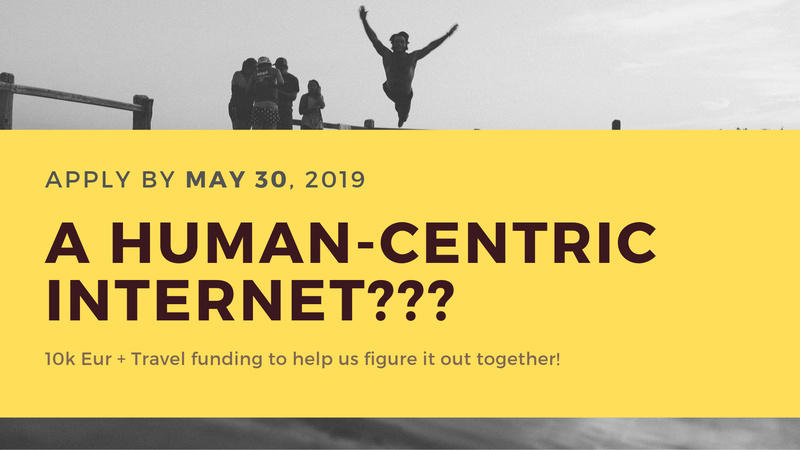 Tell us what you would like to build, explore or learn about building a Human-Centric Internet! Fellows will receive bursaries of up to 10,000 EUR, a travel budget of up to 1,000 EUR, and the opportunity to learn from and connect the next generation of working solutions in building a human-centric internet. Internet of Humans is a gathering of contributors to the Next Generation Internet, a 3 year research project that engages hundreds of original initiatives. The fellowship program offers participants an opportunity to explore, learn from and connect with people building working solutions for an Internet that supports our ability to thrive as individuals, communities and societies. Read what other participants are working on and share your own experiences/work. Arranging and documenting a series of online calls to which you invite people from whom you wish to learn or collaborate. Engage the people you invite to join us at activities for project matchmaking, partnership building and fundraising. Articulate a burning question to move everyone’s work forward, and turn it into a proposal for a research theme and track of a distributed festival. We are looking for Fellows who are passionate, curious and driven, as well as willing to collaborate using online platforms and community building methodologies. If this is you, we want to hear from you! Questions or nominations? Create an account on edgeryders and post them in a comment below. Internet of Humans is a track in a highly participatory, distributed festival showcasing working solutions and demos produced by community members, as well as pathways for working together towards their sustainability and scaling. It will take place in November, 2019 in a number of cities and brings together the broader Edgeryders scene that involves hundreds of original initiatives. Aiming to deepen community collaboration, during May - November 2019, Edgeryders will appoint 3 “students” to support research, community building and content curation for the Internet of Humans community. We use “students” in the Latin sense, of people that will apply themselves to the subject, as fellows of a Internet of Humans Alliance, and not in any sense as an indication of career status. A travel budget: Up to 1,000 Euro, to be authorized in advance by due justification. April 12 Mar - May 30. We collect submissions in the form of published proposals for Human Internet Festival. June 30 - November 30. T.b.d with each fellow so as to not disrupt their other activities. Anyone with a story relevant to building working solutions for an Internet that supports our ability to thrive as individuals, communities and societies. You need to be interested in learning and collaborating with others online and offline. are registered on edgeryders.eu and have introduced themselves in the Internet of Humans online community workspace: Tell Your Story! You will be working closely with the Edgeryders team to build the Internet of Humans community conversation and together with it’s members, put together the program for it’s track of sessions and events within the Edgeryders Festival which convenes our global community. Interview a person relevant to your burning question. Transcribe interview and have the interviewee post it here. You will need to create an edgeryders.eu account to do this. Comment in depth on at least one other transcribed interview. Once you are done use #internetofhumans and #edgeryders to draw our attention to your comments, story and proposal for the program. This will encourage others to get in touch and build support for your work! The deadline for applications is May 30th 2019 , but the sooner you start and complete your application, the higher your chances! For more information come to our weekly online community gatherings every Wednesday in May at 16:00 GMT+2 (CST Brussels time) or sign up on the Edgeryders platform and leave a comment below. I like the call for applications this way Now let’s see what kind of people we can attract. Looking forward to meeting some fellow “crazy hacker” types among them! Fellows will receive […] the opportunity to learn from and connect the next generation of working solutions in building a human-centric internet. I feel like that is for the fellows themselves to define based on their own assesment of what is possible within the time frame set, no? Is one of these Bursaries open to those who live outside of Europe? I live in Canada and am very interested in applying. Are the funds allocated to travel for the event in November? At best, I could only attend that event if I won… is that what is expected?